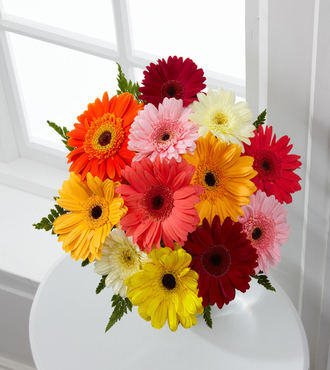 Picked fresh from the farm to bring vibrant color and happy wishes to your special recipient, the Colorful World Gerbera Daisy Bouquet will lift their spirits with each sunlit bloom. Hand gathered in select floral farms and showcasing a rainbow of color, including red, yellow, pink, white, and orange, this simply beautiful flower arrangement has been picked fresh for you to bring fun and excitement to their next birthday celebration, to offer you congratulations wishes, or as an inspiring way to send your get well sentiments. This bouquet includes the following: an assortment of gerbera daisies and a wide variety of vases to suit your every gifting need. Approximately 12- inches in diameter; no vase.